But we’re not just talking about annual planning. It’s what we’re doing here at EMyth as a company. We started our 2017 planning process at the end of the 3rd Quarter, identifying priorities and objectives for the 4th Quarter that would set us up for the new year and make sure that when January 1 arrived, we were off and running. Have you prepared your company to take off on January 1, 2017? We didn’t have to look very far for our thematic direction for 2017. 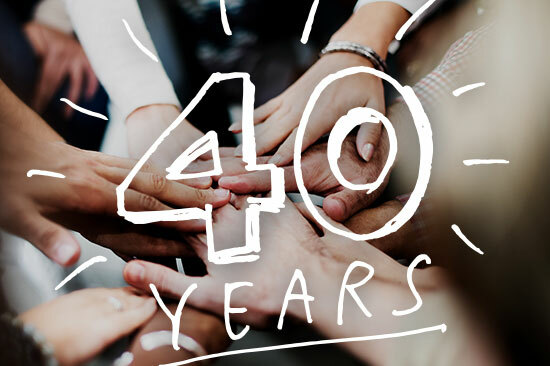 EMyth is turning 40 next year and we’re looking forward to celebrating four decades of helping small business owners throughout the world create a life and a business they love leading. EMyth launched the coaching industry in 1977 at a time when the only advisory support available to businesses, other than the SBA, was high-priced, out-of-reach consultants. There was no place a small business owner could turn to get affordable, high touch, high impact help in building a business that works. That was the need we saw in the marketplace then and the very same need we see today. Our vision hasn’t changed over the years though our business models, our lead generation, lead conversion, and client fulfillment systems and practices, and the technology we depend on to connect our global network of coaches and clients certainly have. As we prepared in Q3 to celebrate our upcoming 40th Anniversary, we reflected honestly on our history that brought us here. We couldn’t help but be touched by the difference we’ve made in the lives of tens of thousands of small business owners and their families who’ve been impacted by our small business coaching program. Our clients have grown their business and profits, increased their income, systematized their operations and, probably best of all, taken their life back. Because of what we’ve learned from the small business owners we’ve had the pleasure to work with, we’ve gained a humble confidence in our ability to guide just about any small business owner in any industry in working on their business, not just in it to create a business that works without them, rather than because of them. At a cost they can afford. At the same time, our reflections brought us to the obvious truth that, over the course of 40 years, there were ways we had lost some of the heart of what made EMyth EMyth at the very beginning, places where our message had gotten fuzzy, our understanding of our best customer had become diffused. Our upcoming 40th Anniversary became a perfect opportunity to “get back to our roots” and recapture the essence of who we are, what we’re here to do, who we’re here to do it for and how we’re going to do it for at least another 40 years. What is your entire company history, or at least the last year, telling you about what you need to do in 2017 to serve your customers better than you ever have before? We kicked off our 2017 Annual Planning Process at the end of Q3 with a one-day offsite with our entire team to invite them into aspects of our company history many of them had never heard about before. We pulled out pictures and audios from the archives of the early days, shared moving stories about how it used to be and why it used to be that way, put the values and principles we live by today—the things we really care about—in the context of our cultural history, and talked about those core threads that have remained unbroken for almost four decades. We made connections between our roots and our current systems, processes and goals that just made things make more sense for people than they ever did before. We didn’t realize just how much our people needed it. Everyone took what they learned about the company in the morning into an afternoon session to define their team’s Q4 goals. A quality of co-creativity was unleashed that I had never seen before. People left that day feeling as close to each other as they’ve ever been and genuinely inspired—to quote an archived tagline—“to transform small business worldwide, one small business owner at a time.” And, the creative energy the day produced seems to be, almost magically, still building in the company. Is your team fully behind your goals for 2017? Have they set objectives for the next quarter designed to move you closer to those goals? As we move into the new year we’re getting our priorities straight and defining our goals with all the flexibility necessary to integrate the inevitable unexpected. In 2017, we’ll continue to reconnect with our roots and what is most essentially EMyth, and find the simplest ways to express it in today’s terms. At EMyth, we want nothing more than to help make this journey called Small Business Ownership as nourishing, productive, and rewarding as it can be for you. As we enter our 40th anniversary year, I want to thank you for following us, whether you started today or many years ago after first reading The EMyth. We’re honored to be a part of your journey. P.S. If you’d like to give yourself a gift of insight into the annual planning process, reserve a seat for next week’s webinar: Your Holiday Gift: A Clear Direction for 2017. It’s this Thursday, December 15, at 10am PST.